Royal Copenhagen stoneware Jeanne Grut (Designer) monkey baby figurine. Measures: 3.5cm / 1 4/10 inches. Perfect condition. Royal Copenhagen stoneware Jeanne Grut monkey and monkey with young figurines. Measures 7.5 cm and 3.5 cm. Royal Copenhagen figurine polar bear with young by Jeanne Grut #4780. Measures 6cm x 5cm. In perfect condition. Royal Copenhagen stoneware figurine duck #656. Measures 11 cm and is in good condition with some crazing in the glaze. 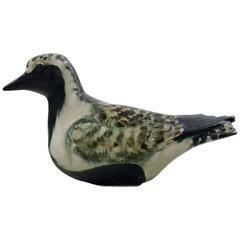 Royal Copenhagen stoneware, number 22486, golden plover. Jeanne Grut. Measures: 10 x 18 cm. In perfect condition. 1st. factory quality. 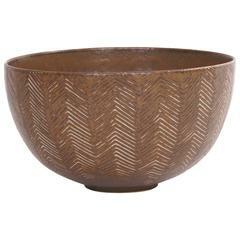 Axel Salto bowl for Royal Copenhagen in green, brown and white elements. Signed by Axel Salto for Royal Copenhagen and '20716'. Dated 1959. Axel Salto, circular roche stoneware vase. Modelled with leaf-shaped patterns. Signed Salto. Royal Copenhagen mark. 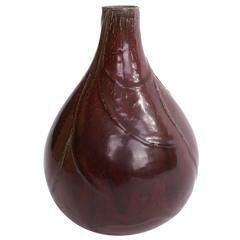 Axel Salto stoneware vase for Royal Copenhagen in oxblood glaze. Signed from Axel Salto and Royal Copenhagen. Made 1950s. Royal Copenhagen number 5154 Kangaroo. Designed by Jeanne Grut. Measures: 15 cm. x 12 cm. In perfect condition 1st. factory quality. Unique sculpture of stoneware of a walrus head. Glaze Type: Bear glaze. Maker: Den Kgl. Porcelænsfabrik. 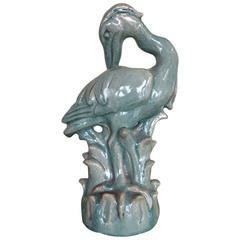 Unusual Royal Copenhagen blue heron glazed ceramic sculpture. Signed and dated 1938. Crackle glaze, heavy and quite large. Note one imperfection-a chip-see photo.